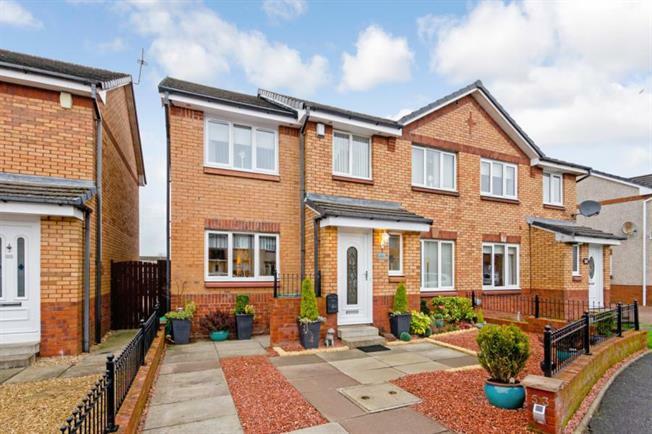 5 Bedroom Semi Detached House For Sale in Renfrew for Offers Over £215,000. This superb modern extended semi detached villa is set within an extremely popular and sought after residential development and offers spacious family accommodation which can only be fully appreciated by internal inspection. This unique property benefits from an outstanding two storey extension and is presented to the market in true walk-in condition. The well proportioned accommodation on offer comprises of a welcoming reception hallway incorporating a conveniently located WC. Thereafter the hallway leads into the front facing lounge with French doors leading into a beautiful breakfasting kitchen with access out into the landscaped rear garden. Furthermore the ground floor extension comprises of added flexible accommodation currently being utilised as a dining room with an adjacent family room incorporating French doors leading out into the enclosed landscaped rear garden. The aforementioned rooms could be used for a variety of purposes depending on the needs of the prospective purchaser. The property offers ample storage. Upstairs offers three double bedrooms with the master bedroom incorporating a stunning en-suite shower room. There is also a single bedroom. The accommodation is completed on the upper level by a luxury shower room. The exacting specification of this outstanding family home includes gas central heating, double glazing, driveway and easily maintained garden grounds. The property is well situated for all amenities including local shopping, schooling at both primary and secondary level, sporting and public transport facilities (both buses and trains). Early inspection is highly recommended to fully appreciate this quality family home and to avoid disappointment.